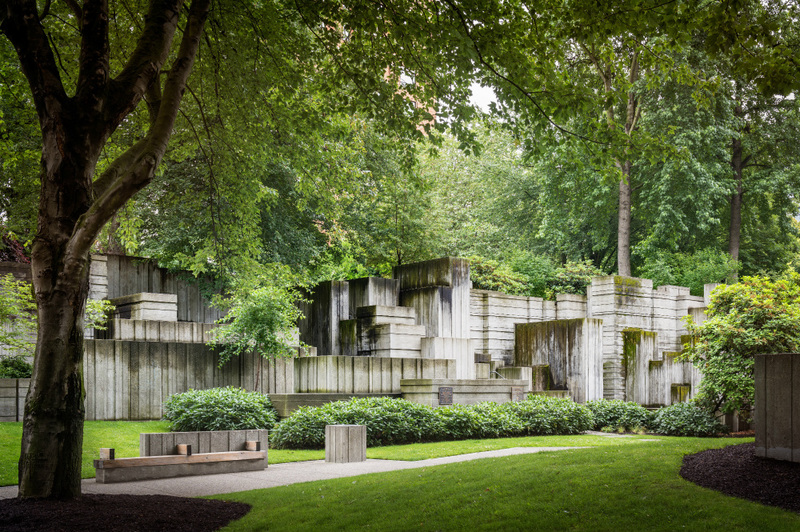 Even as SOM bulldozes Lawrence Halprin‘s Los Angeles atrium (the only atrium he ever designed), officials 1,000 miles to the north are gearing up to preserve Freeway Park, the eminent landscape architect’s highway-capping park in Seattle. Designed by Halprin and Angela Danadjieva and built in 1976, the Brutalist park had fallen into severe disrepair, and residents said that they avoid the somewhat isolated park for safety reasons. After initial, conceptual proposals for the National Register of Historic Places-eligible property provoked alarm, stakeholders said they are collaborating with landscape preservation and advocacy organizations like The Cultural Landscape Foundation (TCLF) on any future changes. The renovations are thus geared towards better lighting and wayfinding in the original segment of the park. On its website, TCLF cross-posted an excerpt from an agreement between public and private interests on the future of the park that stated renovations will follow “the Secretary of Interior’s Standards and Guidelines for the Treatment of Historic Properties, as well as specific guidance for parks found in the Secretary of Interior’s Guidelines for the Treatment of Cultural Landscapes,” two nationally-codified standards for preservation practice. As renovations kick into gear, the City of Seattle is collaborating with Freeway Park Association (FPA), the park’s nonprofit stewards, to repair the park’s facilities and infrastructure. Last summer FPA tapped Seattle’s SiteWorkshop Landscape Architects to produce schematic designs and conceptual renderings for park improvements based on community feedback. Work may also include upgrades to lighting, wayfinding, and entrances, as well as restrooms and site furnishings. $1o million of the project cost is being financed by a public benefits package that stems from the expansion of the Washington State Convention Center (WSCC), a $1.7 billion project that the Seattle City Council has yet to approve. FPA has also received grant money to carry out the repairs.